Oh happy day! I sold the Man Van! Those of you who know me personally know that I have... well, had... a Chevy Lumina Minivan that we used to call "The Enterprise" and/or "The Man Van." Well, Amanda and I have been talking for a little while about buying a new car. 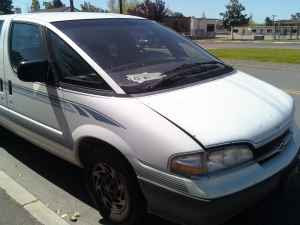 We've been spending so much money maintaining our old cars (my van, which is a '94, and a '93 Buick) that we figured that we could afford a payment for a new one. With that knowledge, plus the fact that in the fall I will be commuting to Pasadena about 5 times a month for school. That's right! As of a couple of days ago, I have been officially accepted at San Francisco Theological Seminary (in Pasadena). And, needless to say, my old van wouldn't have done well with a regular commute like that. So tomorrow morning, Amanda, her father Dan, and I will be car shopping. Pretty terrible, huh? So, lots of changes coming... getting a new car, getting married in June, and going to school. I guess a good Christian boy would have to say, pray for us! This journey will be full of many surprises :) I'm ready and I love you!